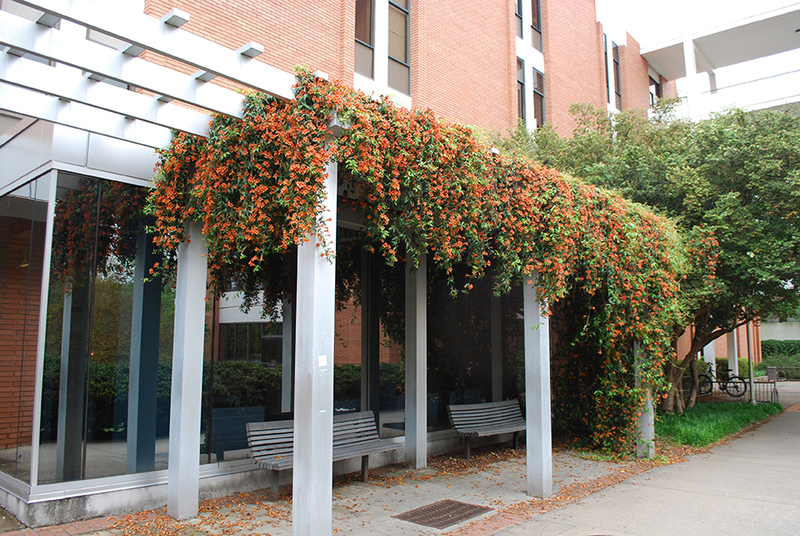 Crossvine (Bignonia capreolata) is a native semi-evergreen to evergreen vine that climbs, twines, and clings with branched tendrils equipped with adhesive disks at their tips that enable it to climb up walls, pillars, arbors, and other supports. The brownish-orange to orange-red trumpet-shaped flowers with a yellow throat appear in April and last for a month. Best growth occurs in full sun. B. capreolata offers year-round interest with shiny dark green leaves that turn reddish-purple in the fall and attractive flowers that are cherished by hummingbirds. 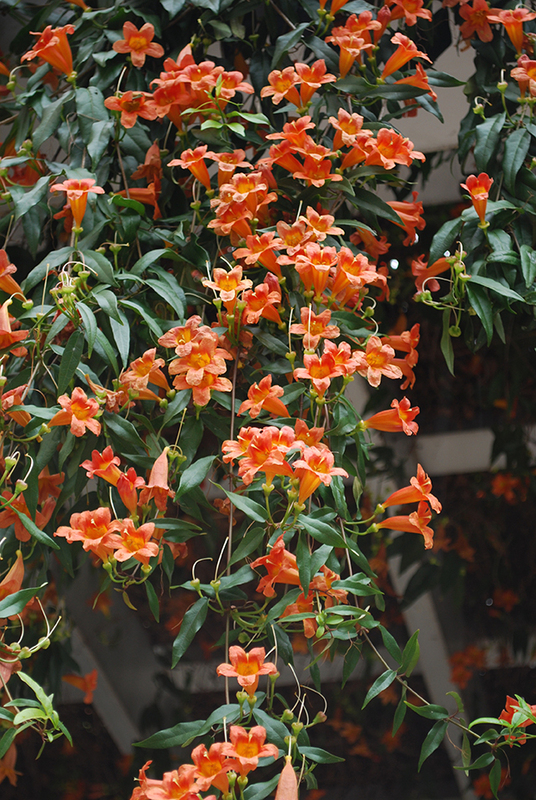 ‘Tangerine Beauty’ has orange-red flowers that repeat through the summer. ‘Jekyll’ has orange flowers with a yellow interior. ‘Atrosanguinea’ has orange-red to brick red flowers; it was discovered by plant hunter and nurseryman, Bob McCartney, co-owner of Woodlander’s Nursery in Aiken, SC, in the early 1980s. According to Mr. McCartney, in the early 1980s he spotted this crossvine in full bloom growing up a telephone pole at a used car lot on Williamsburg St. in Aiken. 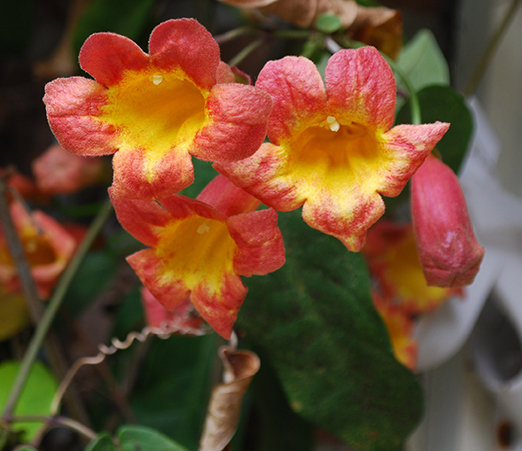 Quite familiar with the typical orange-flowers of crossvine, this unusual red-flowered variation prompted McCartney to immediately take cuttings. Fortunately he did, because the next day the telephone pole and crossvine were removed, and the car lot was bulldozed. Bob McCartney quickly put this vine into production at Woodlanders; however, it was not until Southern Living magazine profiled this red-flowered version of crossvine when it became a popular “gotta have” plant.